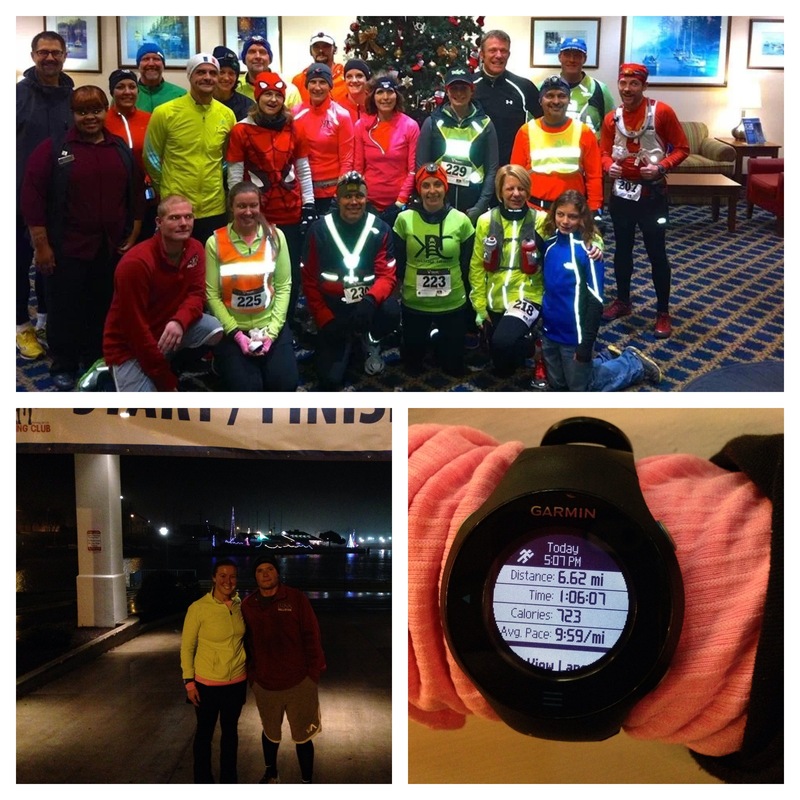 This week my running club took on a big challenge to help a fellow runner come closer to his goal of 160 marathons in 2013. 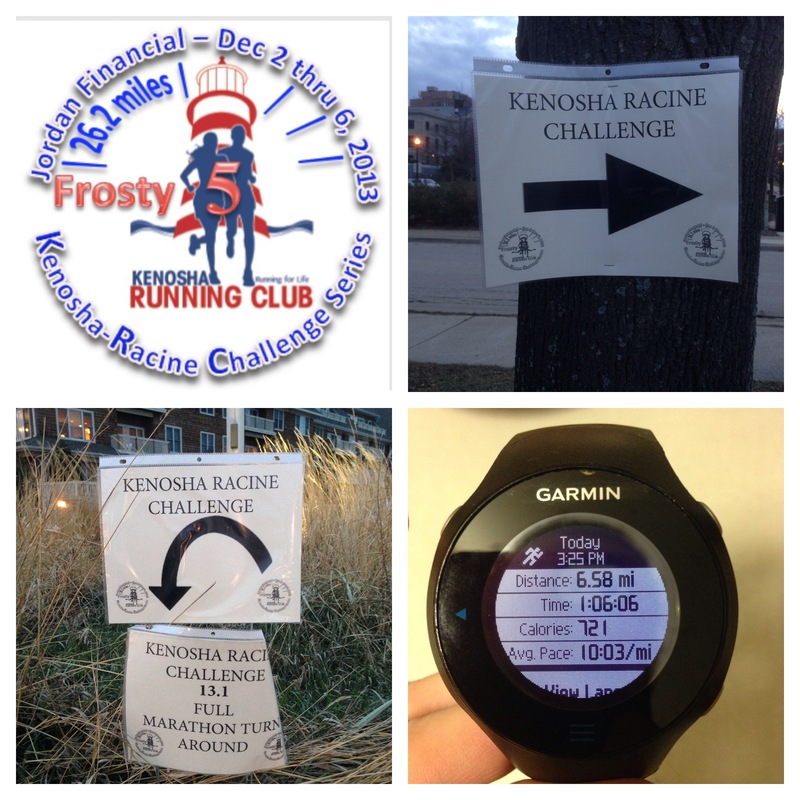 The club put together the Frosty 5 challenge, 5 days 5 marathons and a bunch of crazy runners. For some of us that have never ran a marathon and have no desire to run a marathon, there was the option to run the marathon distance over 5 days. So each day a half marathon and quarter marathon was offered. At first I signed up just to volunteer at the 13.1 turn around in Racine, I could only help for 2 of the days because the race was run in the morning some days and in the evenings others. So on Sunday I descided to sign up for the virtual option and challenge myself to complete the 26.2 miles. So I helped with the two evenings, after running the quarter marathon with the group. I ended up signing up for the virtual option so I could join the fun when I could, but also do some miles on my own. Monday night I ran alone, Wednesday/Thursday I ran with the group and Friday I ran with Chris since I couldn’t make the 6am start (darn work getting in the way!) So at least 6.55 miles each time would equal the 26.2 distance that Marathon Man was running everyday. 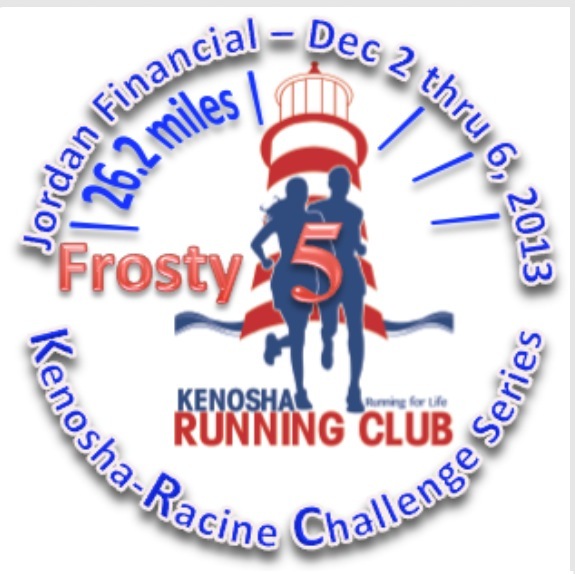 The 5 races in Wisconsin were number 136-140 for him, only 20 more marathons for him to got to his goal! I ran on my own by the Racine lakefront, it was windy but I was determined to get my 6.55 in on my own. 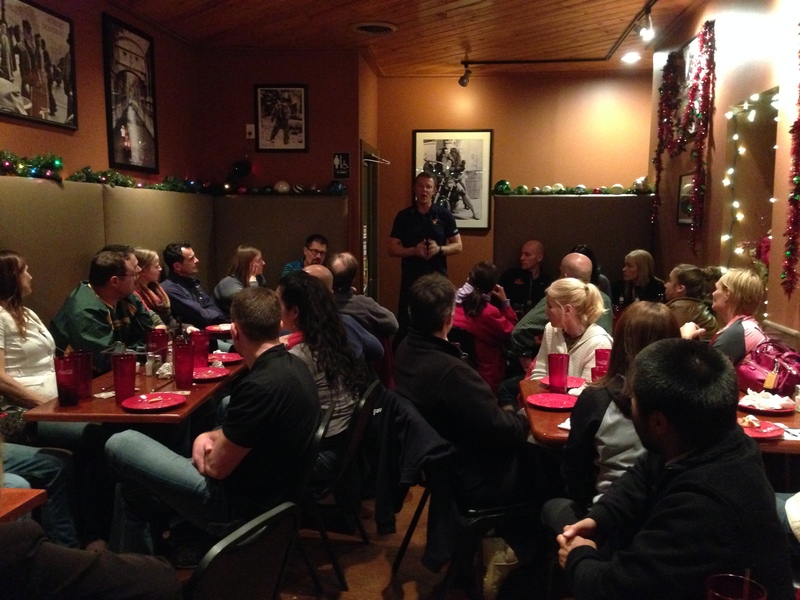 The weather was crappy so I didn’t run, I did join everyone at Kaisers for pizza and to hear Trent (Marathon Man) speak to the group, it was so nice to see club members and to get to eat some tasty pizza. My first run with the group, we had a great turnout and Chris and I ran our first race together, it was so fun to run side by side with him, I see this happening a lot more in the future. It was super foggy and almost a little warm. We got our 6.55 done and headed up to Racine to wait for everyone at the turn around, it was the perfect evening for the race and so awesome to see so many people who I know complete the goal of running this race. Run #2 with the group, the temperature dropped about 20 degrees from the day before and the wind was killer. luckily I was running with Liz and Mike, so we all suffered but got the miles in. 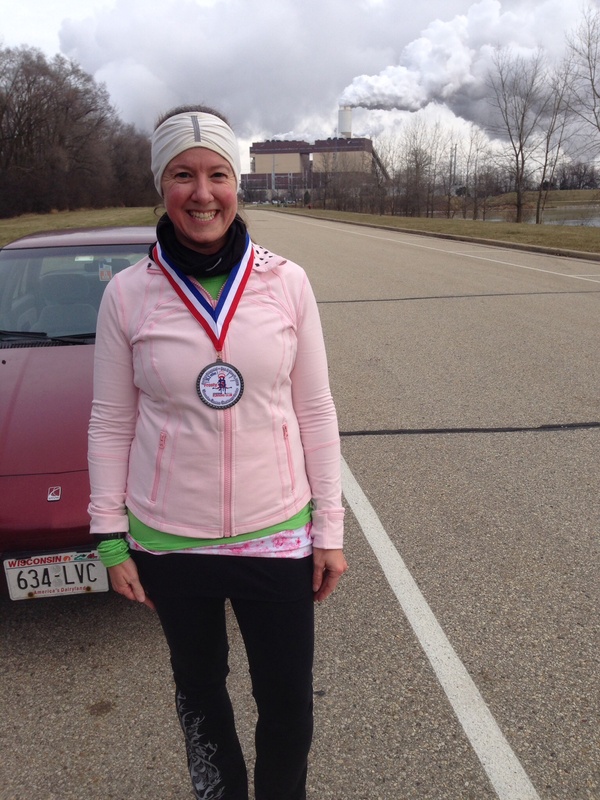 I headed to the turn around and set up, it was so cold by the lake, I sat in my car waiting for runners. I had hot chocolate waiting for Trent and Andy, we headed into the Chancery to give them a chance to warm up a bit before running the final 13.1 miles. 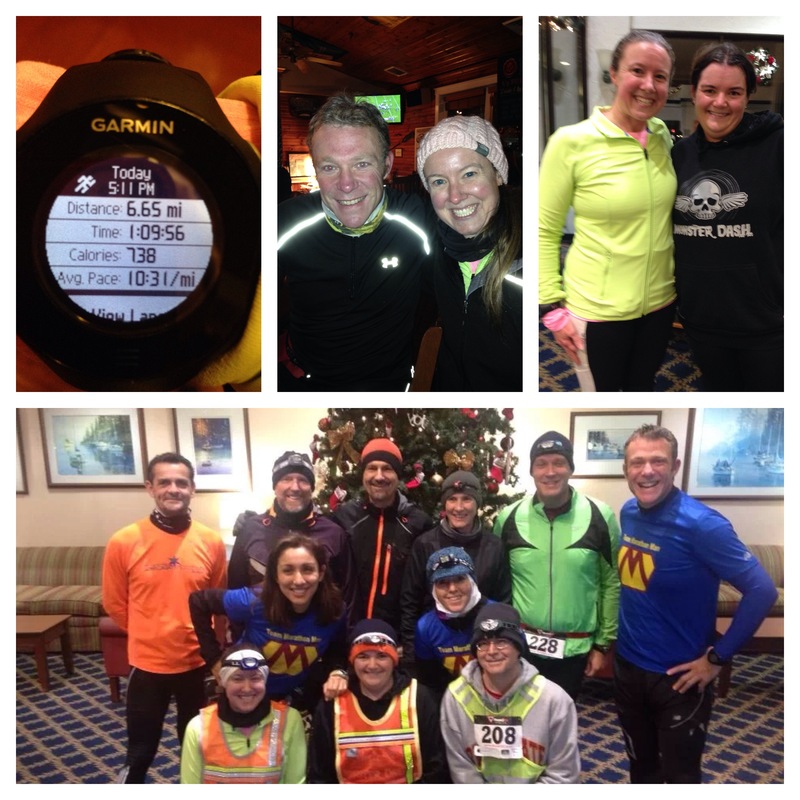 Thursday Quarter Marathon, burrrrrr cold! I did my last run Friday around noon, it was cold and windy but my awesome new running partner and I headed to Lake Andrea to run, we were checking out the gravel trail to see how far it went, it’s almost 2 miles long and felt like it was longer, my legs were achy and sore. I had run more miles this week than I have in a long time. But I wanted to make my goal of 26.2. As we approached 3 miles I knew it wasn’t in the cards. So we ended with 4 miles, but if I count my 4.7 on Sunday I was over 26.2 for the week and I was good with that. I still had a race to run on Saturday so I would have over 30 miles in for the week. At the end of a cold run. This entry was posted in Uncategorized and tagged Marathon Man, Running. Bookmark the permalink.